We all know that cats can be very vocal creatures, but how closely do you actually listen to your cat? Can you tell the difference between a salutary meow and a cautionary growl? When does cat chirping become a case of feline whining? In honor of National Day of Listening (November 23rd), which is all about taking the time out to pay attention to what the people in our lives are saying, let’s spotlight six cases of cat noises. Note: Make sure to turn up the volume on the videos for optimum cat sounds enjoyment! Sort of like a mix between a standard meow and a chirp, cat trilling is said to be a friendly noise a cat will use as a greeting. The best cases of cat trilling involve repeated trills. When your cat wants to let you know that she really really does not appreciate your current behavior, you can expect her to let out a deep, menacing, guttural growl. Consider this the stuff of horror movies. If you have an indoor cat, you’ve probably come across a case of cat chirping when your feline is posted up at the window and they spot a bird outside. Their reaction at the frustration of not being able to chase down their prey? To let out a curious chirping sound. 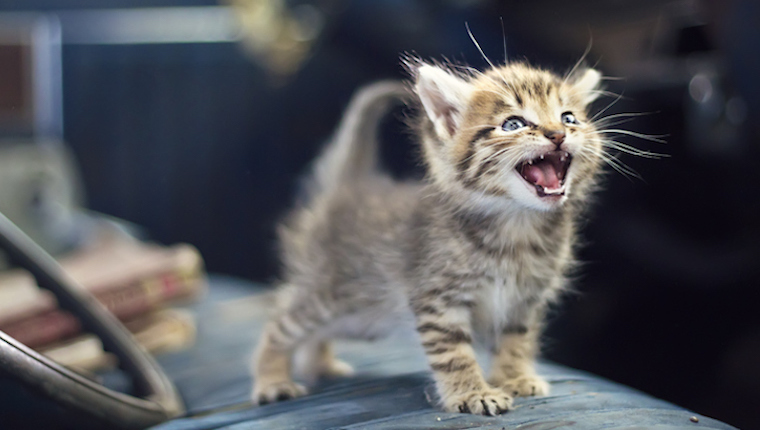 Less fearsome than a growl, cat whining takes place when something is amiss with your cat, like when you’ve been pestering them while they’re trying to nap, or even if they miss you when you leave the house and they feel anxious. Another warning sound: The hiss comes after the growl. So if you reach that stage in an interaction with a cat, it’s best to retreat, as cat hissing means that the cat is really not playing around. Finally, let’s end with a classic case of cat purring–the sound your feline makes when they’re totally happy and relaxed. Some may say it’s the best sound in the whole world, and I’m not one to argue with that opinion. Does your cat make a weird noise that we haven’t covered? Describe it to us in the comments below!